Well how about that correction in the S&P 500? Everyone suffered the 6% downward move and now we can all resume earning wealth…or can we? Is there some negative energy left in these markets? The tea leaves tell me that the corrective move is not over. As a reminder, just reading the tea leaves is about as antiquated as can get for a method of analysis. Looking at some squiggles on a chart and then making wholesale investment decisions is dangerous, but still, I think it’s one of the practical components on the speculator’s tool belt. Let’s start by taking a look at the S&P 500, using SPY(weekly) as our proxy, and then we’ll move into some complimentary areas that may help shape the analysis. Bear in mind with Plunge Protection out there and HFT pace-setting through momentum ignition, all analysis is completely nullified should new highs be strongly set and the uptrend is fully resumed. Now prepare to be over-charted. 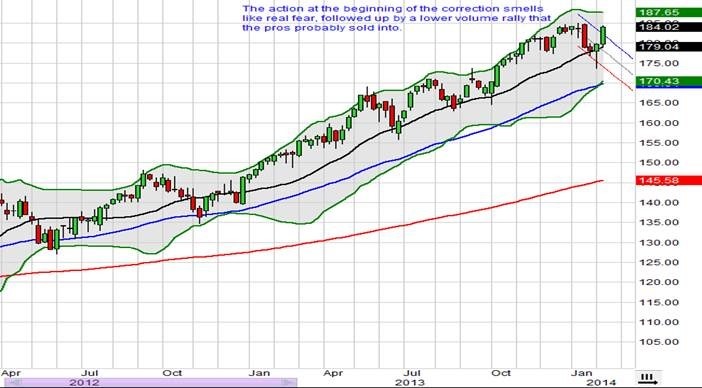 I think when this correction resumes, we’re looking at an endpoint underneath the 50-Day EMA(blue line). I think it’ll kiss that into the 165ish area before bottoming out. I just don’t believe that a 6% move down is the end of it. 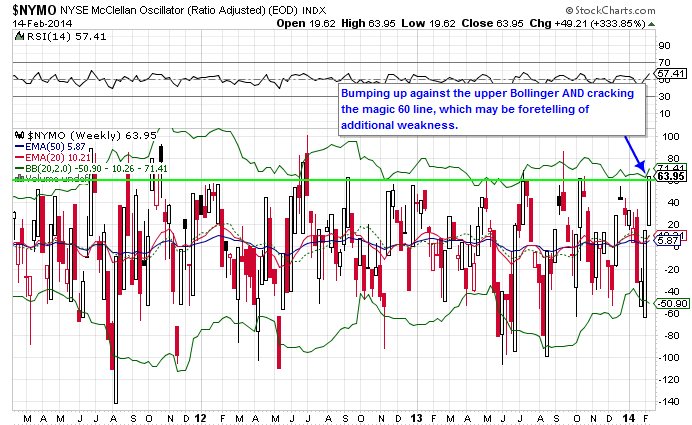 In 2013, all the corrective moves capitulated at the Bollinger mid-point. From the wide ranging fear that I observed, that just doesn’t feel appropriate for the correction here to start 2014. 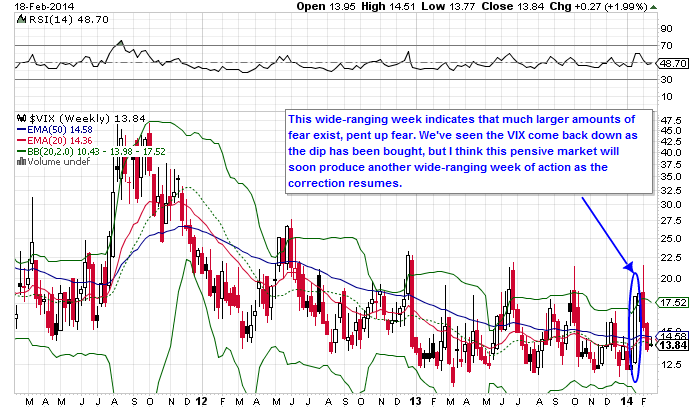 Take a look at the VIX for moment. Yeah, yeah, I know the VIX is played out but it still provides clues as just one chart of many in attempting to get a better feel for market action. Okay, all kidding aside on my make-believe and totally fake “Rhombus of Hades” pattern, a downside move in yields in combination with ZIRP will continue to push market players into equities; especially if that yield pushes much lower to potentially 2.4% or even as low as 2%. 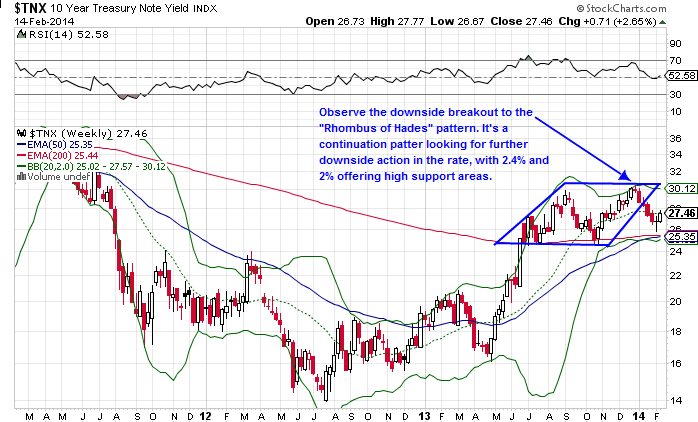 I’m not saying that yields aren’t going to go higher in the long-term, just that the near-term outlook is presenting a potentially downward path in yields. The Nikkei has maintained a fairly solid correlation with the S&P 500 and its action looks constructive as it may be basing for a resumption of its own uptrend. 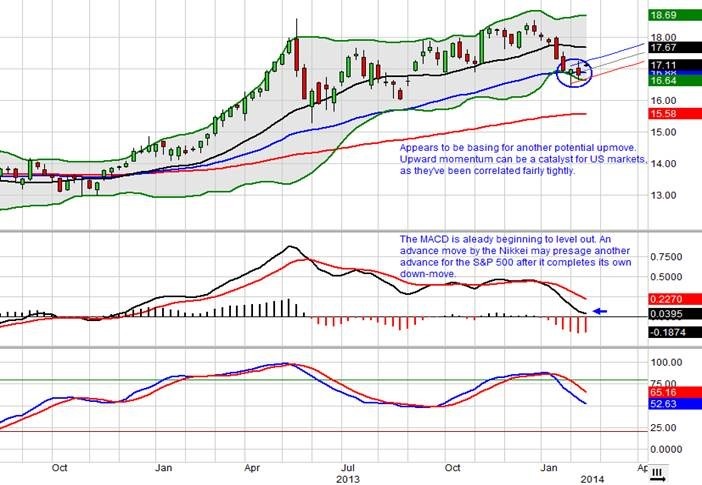 The two indicators below are the MACD and Full Stokes. 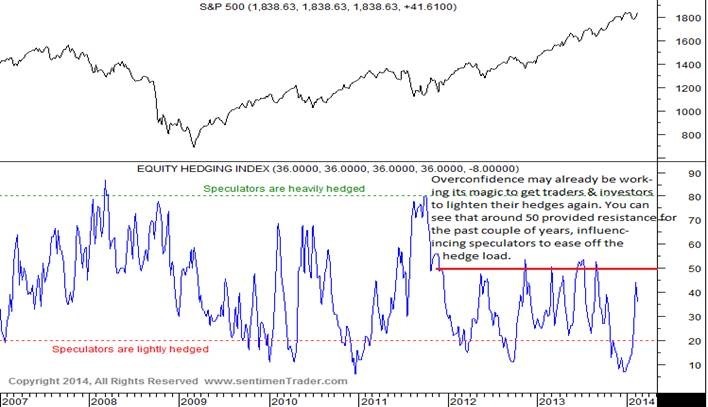 One last set of charts I’d like to share is the Equity Hedging Index(“EHI”). The EHI is one of the many proprietary models that can be found at SentimentTrader.com. It’s a contrary indicator, meaning lower extremes in the chart should produce a rally in the markets and vice versa. The EHI aggregates several inputs such as cash raising, Put purchases, and various other factors in order to construct a usable indicator. For more details, visit the site and take a free trial to see if the service is right for you. As I’ve stated on numerous occasions, I do not receive any compensation from them and I’m quite confident they don’t even know the MarginRich blog exists. Fortunately for my readers, Jason Goepfert, proprietor of SentimentTrader, is cool enough to allow people to republish his work as long as it’s not excessive and the work is credited. Here’s a current read of the EHI. And in case you need a visual on how well the EHI has performed in assisting traders see where some of the bigger turns have been occurring, observe the following chart from January 14th, 2014. It’s not perfect, but then again, no single indicator is. If using technical analysis, it’s best to observe a wide variety of charts and cumulatively interpret them, so that one may obtain a more productive assessment. But this is all rubbish really because bias inherently sways emotions and thought process, and thus the analytical outcome must be considered questionable. If this sort of analysis is all you rely on, such as what I do here for the blog, then more power to you. For the record, before committing my own capital I analyze a broad swath of data; not just squiggles. Occasionally, squiggles may be all it takes to ascertain that a function-able trade has presented itself, but I like to mix fundamental analysis in combination with micro or macro economic reads. It is decidedly better to test quantifiable inputs to statistically determine, so to speak, probable outcomes when attempting to make valid trading decisions. Have a read of this Price Action Lab blog entry. 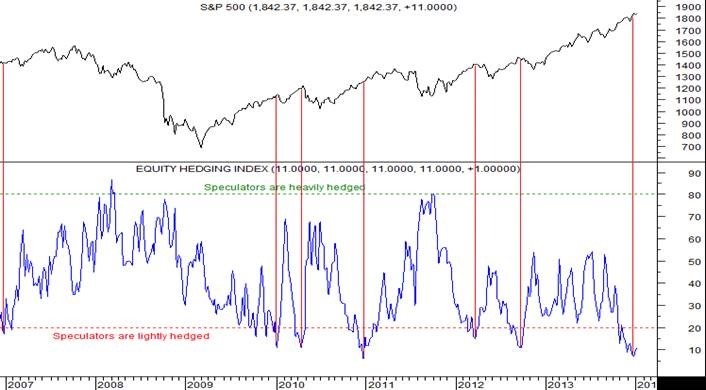 Based on his analysis, Mr. Harris states that the market is in mean-reverting mode. Long story short, he basically states that the market is fragile and so any suitable catalyst could cause a correction. My conclusion is that I wouldn’t pick now to be throwing all my chips into the middle of the table as if everything is all clear. There are enough signals out there stating that one should trade with caution, especially if attempting to position long. It may be best to wait in cash, but if you gots the stones and the know-how, then it appears a nice set-up is forming for shorting or Put option strategies. Before I bid you adieu, just want to let readers know that I’ve created a new link up top called Portfolio Updates. That’s where I’ll be placing the ETF portfolio updates from the January post titled, A Few Sample ETF Portfolios to Watch. I would describe the results thus far as interesting, but not all that compelling just yet. If you haven’t read the article then click the link and have a read, then check the updates to see how they are stacking up.